John Thompson, a British World War II engineer, was considered missing in an action for more than 70 years. 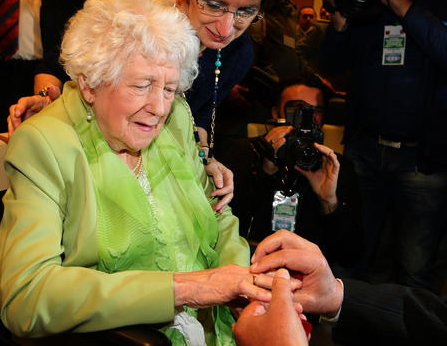 On Monday, his 92-year-old sister Dorothy Webster received his ring from a family in Albania together with a box of pieces of a plane. The plane, with seven members, had crashed in the eastern European country on Oct. 29, 1944 while carrying assistance to local anti-Nazi fighters. In 1960, a man named Jaho Cala found Thompson's finger with the ring at the Sinoi Mountain, 25 miles north of the Albanian capital Tirana. He kept the ring and hid it at his home. Cala asked his son Xhemil to look for the family of the owner and after he died, Xhemil contacted the embassies of the U.S. and Britain - the two countries that helped liberate Albania from the Nazis a month after Thompson's death. After three months, the British embassy confirmed the ring was Thompson's and told his family and the families of the other six members. Webster said her parents never locked their house, because they were waiting for their missed son. Xhemil Cala said he is relaxed to have finished his father's wish to return the ring to the owner's family. "I will go to his grave and say rest in peace for your dying wish has been finished," he said. 1. What did John Thompson do in World War II? A He was a soldier. B He was a teacher. C He was an engineer. D He was a doctor. 2. When was John Thompson’s ring found? 3. Who returned the ring to John Thompson’s family? 4. Why did Thompson’s parents never lock their house? A Because they hoped their son would come home. B Because they didn’t like to lock the house while sleeping. C Because Thompson asked them not to lock the house. D Because Thompson would come home in the night. 5. What was Jaho Cala’s dying wish? A Visit the owner of the ring. B Return the ring to the owner's family. C Liberate Albania from the Nazis.